Toll-like receptors (TLRs) are the best studied pattern recognition receptors (PRRs) and their importance in stimulating innate and adaptive immunity is now well established. TLRs are sensors of microbial components as well as host-derived endogenous molecules released by injured tissues. TLRs play a critical role in defense against invading pathogens but are also involved in other serious pathological processes, such as tumorigenesis . In view of this, TLR agonists have great potential as immunotherapeutics or vaccine adjuvants for the treatment of infectious diseases, cancer and autoimmune diseases. One of the most successful empiric vaccines ever developed, the live attenuated yellow fever vaccine YF-17D, activates immune cells via multiple TLRs . In the same line, microbial products, such as Coley’s toxin (a mixture of killed Streptococcus pyogenes and Serratia marcescens bacteria) and Bacille Calmette-Guérin (BCG, an attenuated strain of Mycobacterium bovis), which have been used as anticancer agents with some success, induce the host immune system through the activation of several TLRs. Studies have demonstrated that YF-17D and BCG efficacy requires a Th1 cytokine response which promotes antigen-specific cytotoxic T cells [2, 3]. Today, very few TLR agonists are approved for clinical use as stand-alone agents or adjuvants . One of the major challenges of cancer immunotherapy is the reversal of tumor-driven immune suppression. Tumor cells release soluble factors leading to tumor infiltration by immune cells and their convertion into potent immunosuppressive cells. Among the immune suppressor cells, myeloid-derived suppressor cells (MDSCs) are the focus of extensive studies. MDSCs release additional soluble factors that stimulate tumor growth, induce regulatory T cells and suppress CD8+ T cells, thus impairing tumor surveillance and antitumor responses . TLR3 or TLR9 agonists, which elicit strong IFN-α responses, have been shown to induce MDSC maturation and loss of suppressive functions, in contrast to TLR4 agonists which support MDSC suppressive functions . 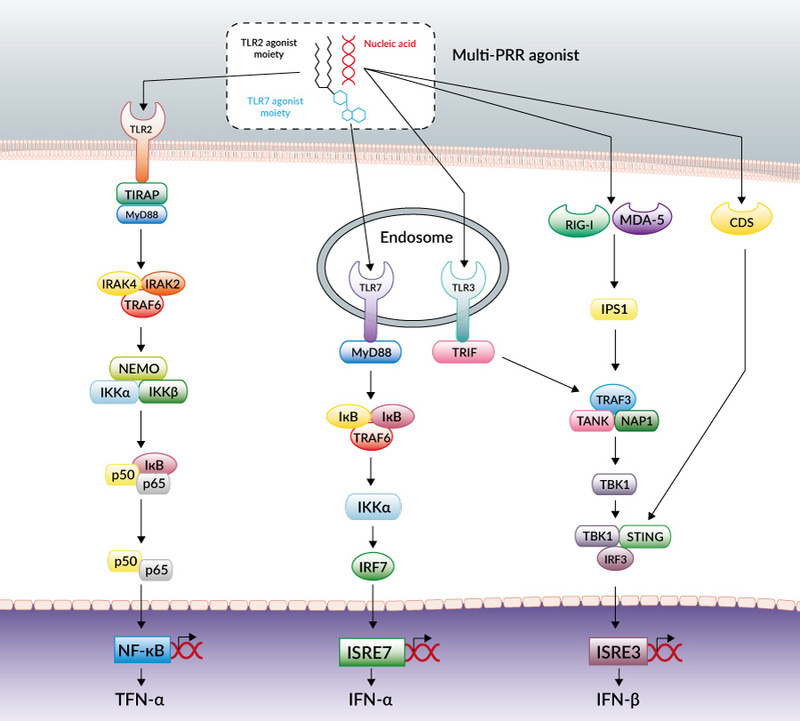 Schematic representation of innate immune signaling pathways activated by PamadiFectin™ (CL553), a multi-PRR agonist that activates TLR2, TLR7 and nucleic acid sensors when complexed with dsDNA, for example. 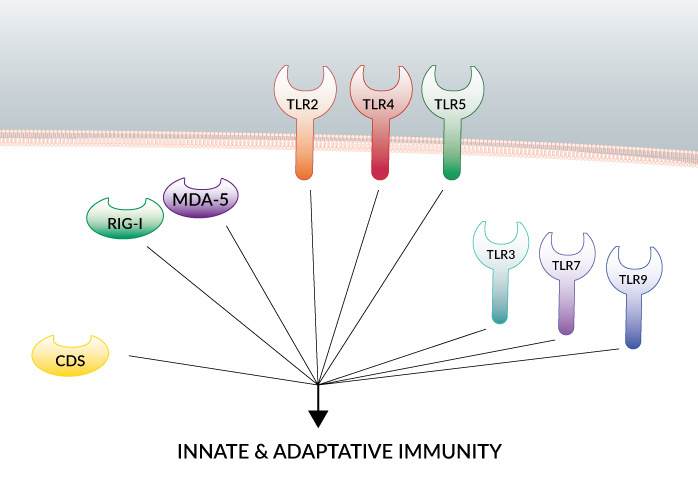 Given that TLRs are expressed in different cellular compartments, by different cell types and that they trigger different signaling pathways, combining TLR agonists can act in synergy to promote Th1-type immunity. Encouraging clinical results have been reported with the combination of BCG and the TLR7 agonist Imiquimod in melanoma patients . Furthermore, vaccination studies have demonstrated that the combination of Imiquimod and MPL, a TLR4 ligand, elicits synergistic increases in antigen-specific neutralizing antibodies compared to a single TLR ligand . The combination of TLR agonists with agonists for other PRRs, such as the sensors of nucleic acids RIG-I/MDA-5, IFI16 and cGAS, may further enhance the immune response against cancer and infectious diseases. With this perspective, InvivoGen has developed multi-PRR agonists that activate TLR2 and/or TLR7 and can complex nucleic acids, such as double-stranded DNA, leading to additional recognition by cytosolic DNA sensors (CDSs). These molecules have been shown to induce a strong immune response in a murine melanoma cancer model and in vaccination studies. By mimicking the potent natural immuno-stimuli that are viruses and bacteria, multi-PRR ligands represent an interesting new class of agents in cancer immunotherapy or vaccination. However, further studies are needed to develop the best PRR agonist combinations for a given application. 1. Rakoff-Nahoum S. & Medzhitov R., 2007. Regulation of spontaneous intestinal tumorigenesis through the adaptor protein MyD88. Science. 317(5834):124-7. 2. Querec T. et al., 2006. Yellow fever vaccine YF-17D activates multiple dendritic cell subsets via TLR2, 7, 8, and 9 tostimulate polyvalent immunity. J Exp Med. 203(2):413-24. 3. Saint F. et al., 2001. T helper 1/2 lymphocyte urinary cytokine profiles in responding and nonresponding patients after 1 and 2 courses of bacillus Calmette-Guerin for superficial bladder cancer. J Urol. 166(6):2142-7. 4. Galluzzi L. et al., 2012. Trial Watch: Experimental Toll-like receptor agonists for cancer therapy. Oncoimmunology. 1(5): 699–716. 5. Gabrilovich DI. et al., 2012. Coordinated regulation of myeloid cells by tumours. Nat Rev Immunol. 12(4):253-68. 6. Lindau D. et al., 2013. The immunosuppressive tumour network: myeloid-derived suppressor cells, regulatory T cells and natural killer T cells. Immunology. 138(2):105-15. 7. Kidner TB. et al., 2012. Combined intralesional Bacille Calmette-Guérin (BCG) and topical imiquimod for in-transit melanoma. J Immunother. 35(9):716-20. 8. Kasturi SP. et al., 2011. Programming the magnitude and persistence of antibody responses with innate immunity. Nature. 470(7335):543-7.